High flow, zero leak, low pressure drop check valve suitable for many fluid and gas applications. 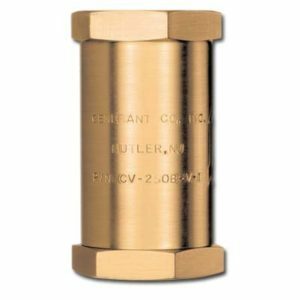 Fully guided poppet with free floating O-ring design is extremely tolerant of particulate contamination. A metal to metal positive stop in both the open and checked position protects O-ring and spring from over-stress fatigue. Zero external leakage is achieved by the utilization of a static O-ring seal with PTFE backup ring. 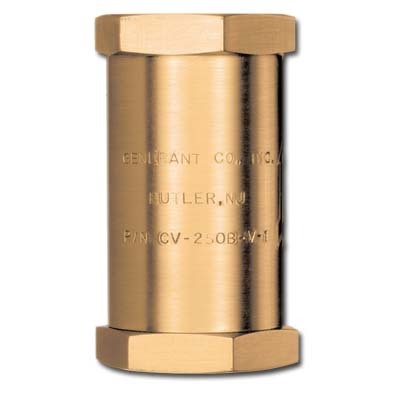 When specified with the proper seal material, these valves are ideally suited to cryogenic system applications. Leakage: Zero to maximum operating pressure. PTFE seals may require back pressure to seal leak-tight.